We live in a world of self-promotion, and some of us are less comfortable in it than others. Last month I sat with a roundtable of 8 winemakers at Presqu'ile owner Matt Murphy's home, and the resulting conversation became my column this month for Palate Press. Ironically, the one winemaker I didn't quote at all, Kevin Law, made wines that impressed all of us. It wasn't that Law didn't speak. I tasted two wines from each winemaker, and we talked about them, and the general conversation went where it went (inexorably into the topic of alcohol level). Law was just too polite to jump into the current. So because Law's not going to blow his horn, let me do it for him: this guy makes delicious wines; my notes for one read: "Just a great expression of Pinot Noir." 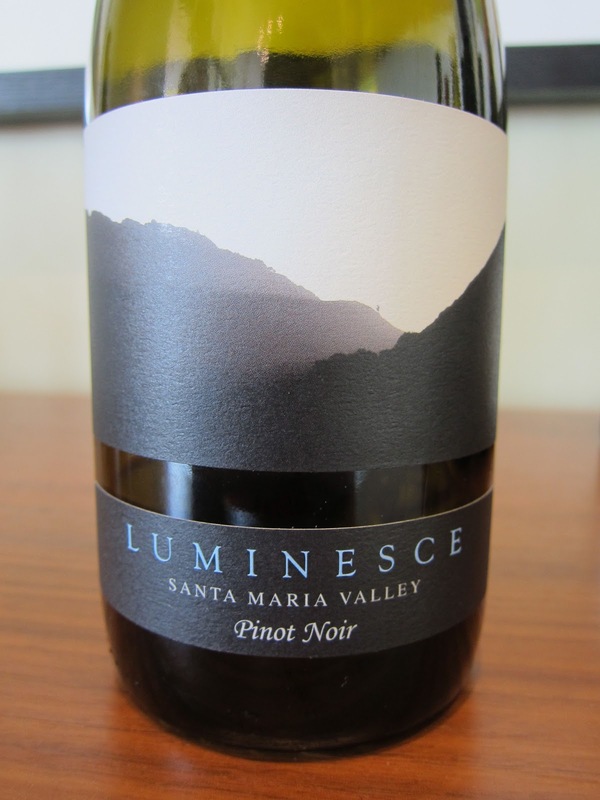 His label, Luminesce, is new, but he's not a newcomer to the field, as he spent seven years as assistant winemaker at Tantara before going out on his own last year. I asked what his philosophy is. "It's definitely minimalism," Law said. "I try to keep the free-run and the press (juice) separate. I use low to moderate sulfur levels." I pried out of him that his degree is in meteorology; he plans to make Chardonnay and Semillon this year from Arroyo Grande; and he might even make a Napa Cabernet. He is already making 1000 cases and, if people discover his wines, he could expand from there. That's all I know of the Kevin Law story. But then there were these two wines, which impressed the entire roundtable with their lovely mouthfeel. I asked how he achieves that, and he shook off the praise. So here's the praise in more detail. The silky mouthfeel makes this wine special; it's not soft exactly, because it has a line of acidity and tannin down the middle of the tongue, but this wine just feels good to put in your mouth. The dark cherry and raspberry fruit make it a pure pleasure; alcohol is a moderate 14.1%. 92 points. This is the wine I called "a great expression of Pinot Noir." The body is light; the fruit is raspberry, with the brightness that implies; the texture is silky on the sides of the mouth with acid and tannin cleansing the tongue down the center; there's some spiciness and a hint of stemminess on the nose to keep it interesting and make you wonder what it might evolve into. And it's a very modest 13.4% alcohol. 95 points. Read the Palate Press roundtable (with Law silent) here. How much does personal taste matter in judging?